We’re nearing the end of winter and I’m ready to welcome the season of gardening, planting, and flowers! I might be jumping the gun a bit, but is anyone else over the frigid temps and grey skies? Easter is much earlier this year as well, so all the more reason to jump on it. Typically, Easter means the arrival of all sorts of sugary sweets. Chocolate eggs and jelly beans galore. 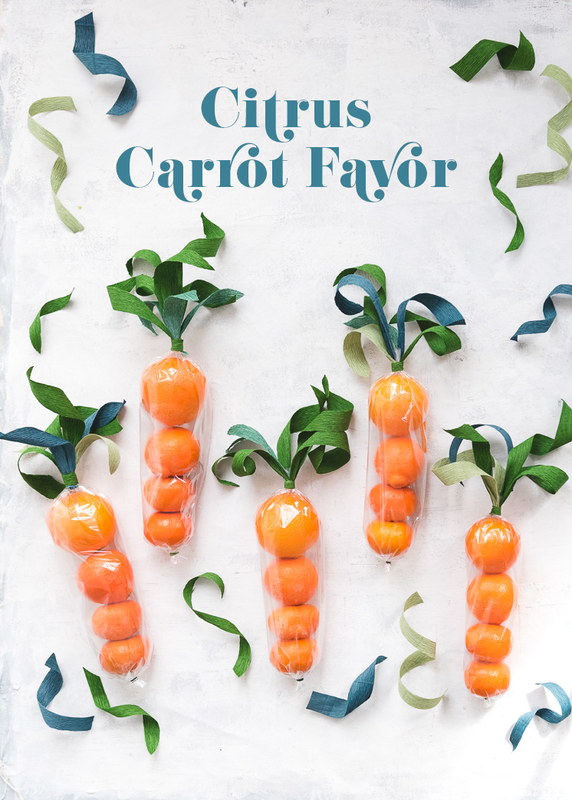 So here is your healthier alternative: Citrus Carrot Favors are made of three different varieties of citrus fruits to build this sweet carrot! Don’t get me wrong, I’m all for sugar, but we thought we’d create a more refreshing alternative to mix things up. 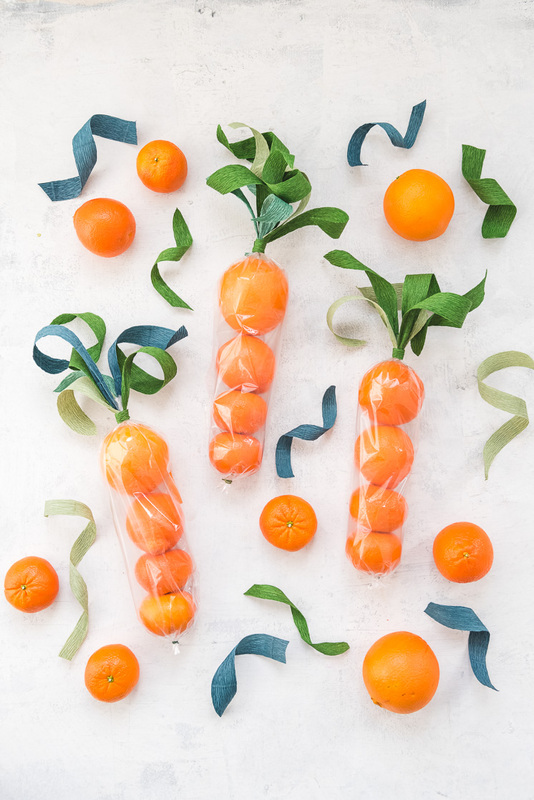 Bring these Citrus Carrot Favors to the office, the classroom, or to your neighbors as a seasonal treat! Chances are they’ll appreciate the sentiment and the juicy fruit! Get the easy how-to after the jump! 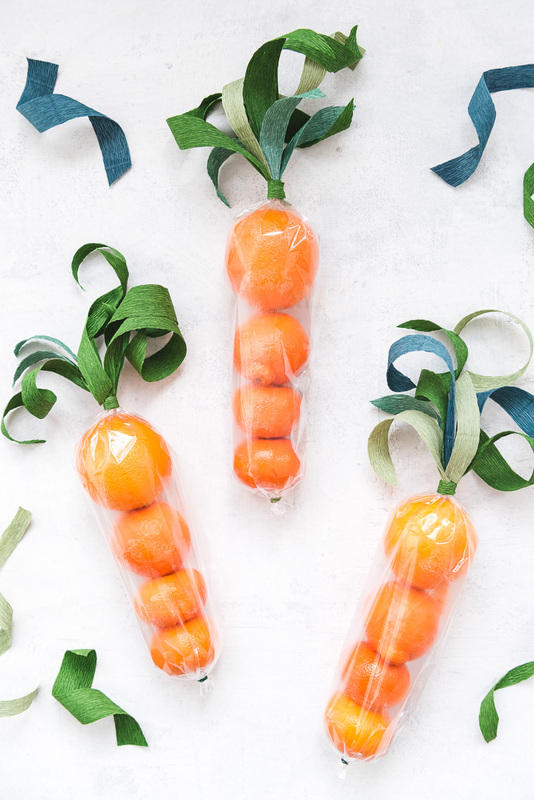 Citrus is very in season right now, so it’s the perfect opportunity to make these Citrus Carrot Favors because oranges are cheap! And let’s be honest, a citrus carrot is much sweeter than a regular carrot! Set aside 4 oranges to create a carrot-shape. We used 1 cara cara orange, 1 tangelo, and 2 tangerines. 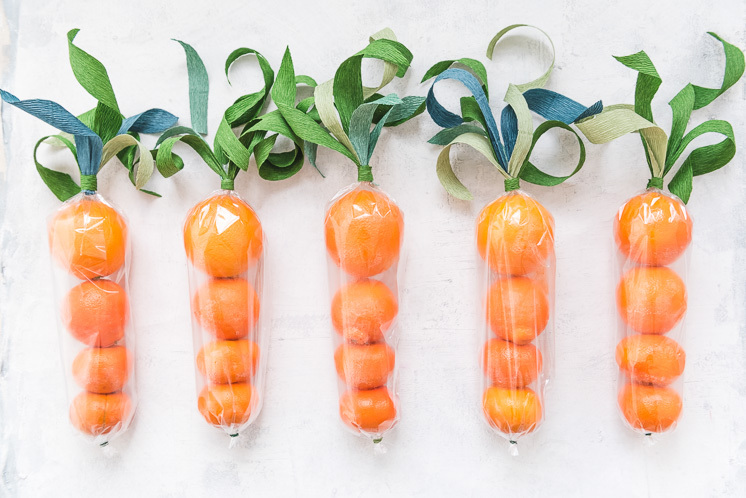 Cut a piece of cellophane about 10 to 12-inches wide (or however wide it needs to be to wrap around your largets orange) and 18-inches long (or however long it needs to cover the length of your “carrot” with 2 additional inches on the top and bottom. 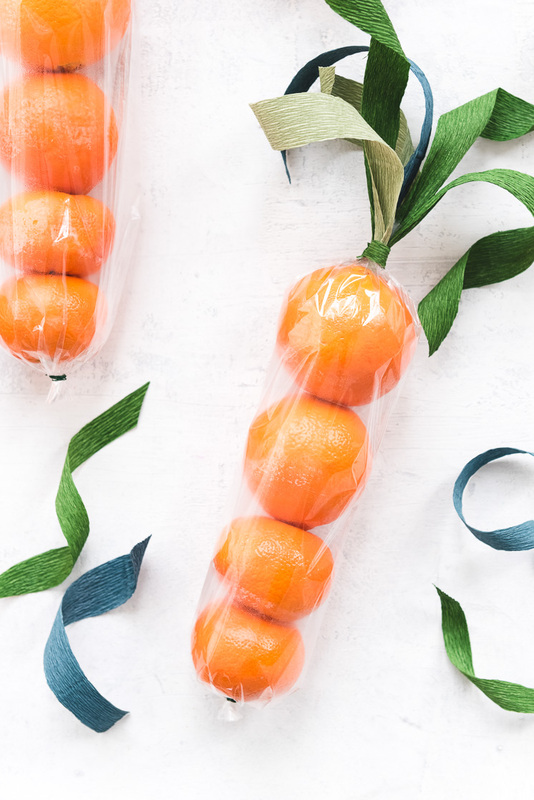 Set your oranges on top of the piece of cellophane, lined up along the long edge of the paper, leaving a few inches of cellophane below and above the oranges. 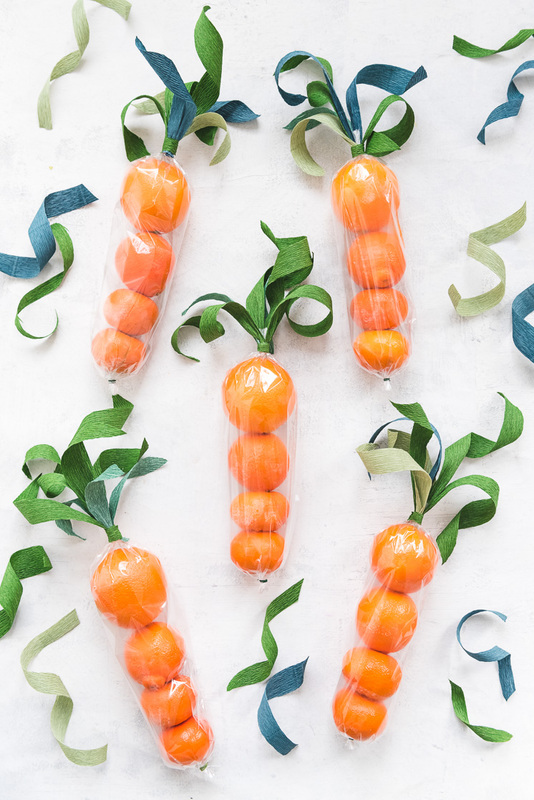 Roll up the oranges so the cellophane wraps around them and twist the top and bottom to secure the oranges within the paper. 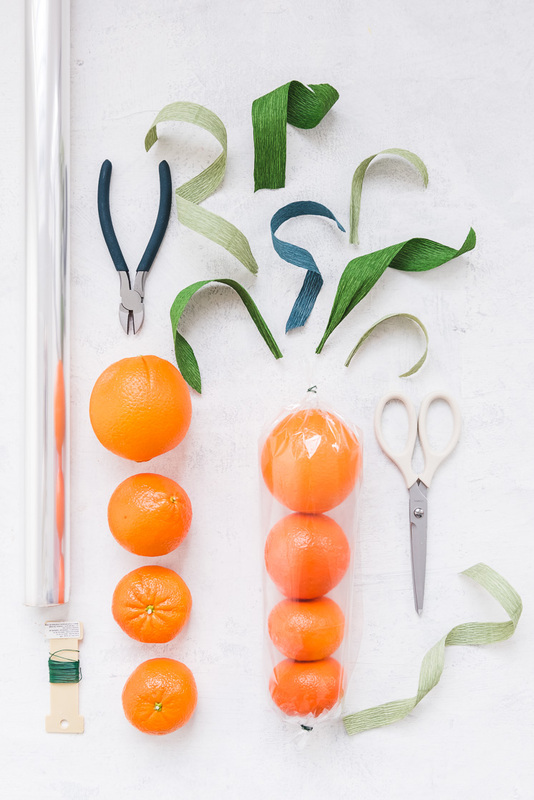 Wrap a small piece of wire around the top and the bottom to keep the oranges in place. Trim the cellophane. Cut .5-inch to 1-inch wide strips of green crepe paper in various lengths ranging from 5 to 10 inches. Cluster some green strips and cluster on the top of the carrot and wrap and small piece of wire around the top of them. Hot glue and wrap a small piece of crepe paper around the base of the leaves.